On Sunday, June 19, 2016, the Inns of Aurora will present its annual Father’s Day Barbecue on the lakeside lawn of the Aurora Inn from 12:00 p.m. to 4:00 p.m. 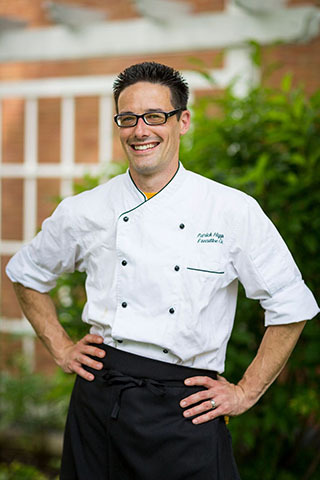 The barbecue will be prepared by the Patrick Higgins, executive chef of the Aurora Inn Dining Room, and his culinary team. The buffet costs $30 for adults, $15 for children under 12, and is free for children under 5. As a special nod to fatherhood, dads are welcome to enjoy free draft beer during the event. Father&apos;s Day in Aurora is so much fun,” comments Meryl Eriksen, food and beverage director. “The beer is cold, the grill is hot, and everyone gathers on the lawn. Why make dad cook?” The afternoon will feature a variety of activities for all ages, including a live Dixieland jazz band and a roving magician. Staff is on hand to entertain children with lawn games, swimming, canoes, and kayaks. The Aurora Inn’s bluestone patio will be tented; the barbecue will be held rain or shine. The afternoon’s menu will feature barbecue classics grilled on-site. Southern staples, including St. Louis Spare Ribs and Texas-Style Barbecue Beef, will be complemented by soulful sides of four-cheese macaroni and blue cheese coleslaw, among others. For a sweet finish, guests can create their own treat at the Purity ice cream sundae bar, or indulge in a slice of homemade key lime pie. A full menu is available online. Hailed by Gourmet as the “modern face of the Finger Lakes,” the Aurora Inn Dining Room offers breakfast, brunch, and dinner year-round with a focus on locally-sourced ingredients and from-scratch preparations. Lunch is served daily from Memorial Day to Labor Day, and their lakeside veranda is open for outdoor dining seasonally. This year, Higgins was one of the select few chefs in the country to invited to prepare dinner at the revered James Beard House in New York City. He and his team served this sold-out dinner last month. The Aurora Inn is located at 391 Main Street, Aurora, NY 13026. Reservations can be made by calling 315.364.8888 or emailing reservations@innsofaurora.com.